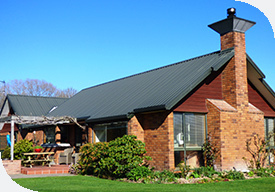 In 2003, Min Cookson, of PGG Wrightson Real Estate, Darfield, helped Tony and Robyn Chaston to move from their large sheep, beef, and deer farm in Windwhistle, Central Canterbury, to a four hectare lifestyle property in Ladbrooks, just beyond the south-west edge of Christchurch. “Well, she was right. It had a lovely feel about it, a lovely home with great design, plenty of light and it really appealed to us, just as Min had worked out, of course. We met the lady who owned it and got on well with her so were able to do the deal, pronto,” he says. They enjoyed the area as it gave them relatively easy access to their roots in the Selwyn District, including a daughter and son-in-law farming at Hororata, while Christchurch was within easy reach. With four bedrooms, two living areas (each with a patio for entertaining), and an established garden, this was just what the Chastons needed after stepping away from the farm. “Although we extended the garden a bit, the basis of what we have enjoyed since was already there and we have made the most of it,” he says. There was also space for Tony to keep his hand in, running a few stock. “We buy in 18-month-old cattle to finish them. While it can be a bit wet in the winter here, meaning you must be careful with heavier stock, we have beautiful soils and grow plenty of grass, even when it doesn’t rain much,” he says. However, after 15 years enjoying the Ladbrooks lifestyle, Tony and Robyn decided it was time for another move, into the city, downsizing one more step. “We have tended to make our moves earlier rather than later. We like to avoid life overtaking us. We started looking before we sold, about a year ago, and we found a place we liked. Because it was going to auction, we went along, though couldn’t bid because we didn’t have enough cash. We thought we might be able to make an offer if it was passed in and do a long possession date, subject to selling our own place. Unfortunately, though, that didn’t work and we realised we had to sell first,” says Tony. Once again, it was Tony and Robyn’s cue to bring in Min. She offered the property for sale in September. Although the election meant the market was flatter than they would have liked, the quality of the house and the desirability of the location shone through, and a professional couple with a young family made an offer that worked for the Chastons. Now cash buyers, they were able to buy on approximately the same market they had just sold on. “Although we reduced our price expectations a little when we sold, we felt that on a market that appeared to be easier, we would make it again on the purchase price,” says Tony. Which turned out to be the case, as they bought a new home in Kennedys Bush in January. “On half an acre and looking out on farmland, so we are not too enclosed by fences and not too close to the neighbours,” says Tony, enabling them to preserve the rural flavour one more time.